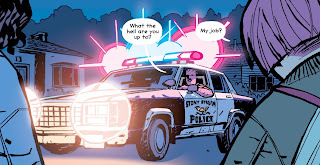 I'm starting to think that there's a trend here in my comic-reading habits - because for all that I love my standard lady superhero stories, the independent comics that I end up reading and loving tend to fall into a pretty simple strategy. Basically, I like them weird and inscrutable. Like the words I've spilled on Wicked + the Divine and Prez and Chew and Saga and Lumberjanes and Locke and Key, to name only a few. I tend to like my indie comics to be really and intensely weird, which explains why I love Paper Girls so much. It's all that weirdness and inscrutability that I love, wrapped up in a candy-colored, time-traveling bow. 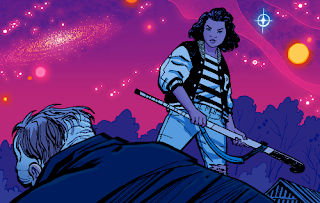 So I have to admit that I can't tell you exactly what Paper Girls is about - for one thing, it's not over yet, and I have a suspicion that this is a story that won't be over until it's over, you know? 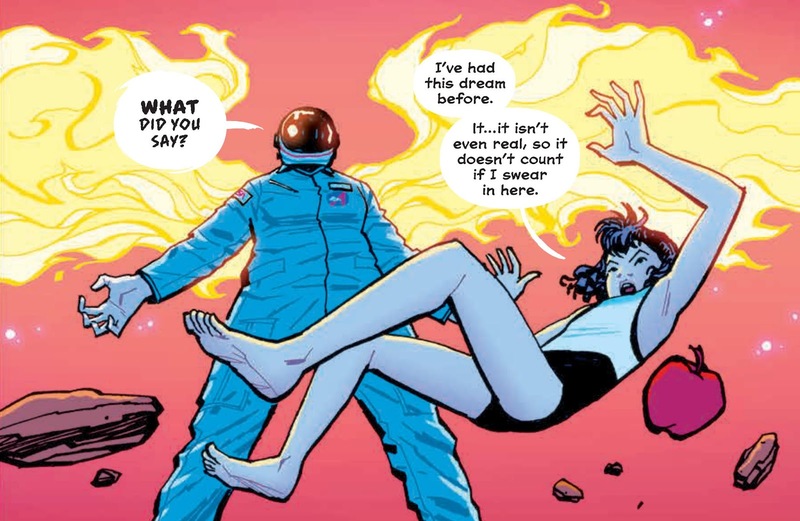 But for the most part, I can't explain Paper Girls to you because it's a story that's written to be intentionally vague, a plot that is meant to baffle you just a little while it pulls you into a really compelling and interesting story. 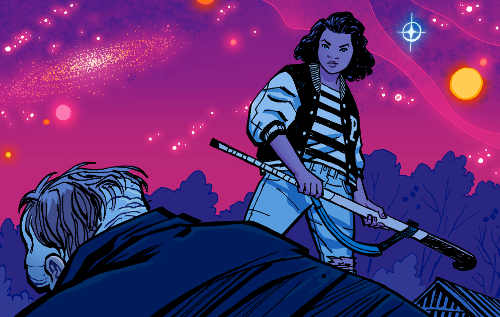 I can, however, tell you what I've gleaned from it so far, and in between the sci-fi adventures and classic 80s references, Paper Girls is shaping up to be a fascinating coming of age story, an examination of the sheer terror that comes from being on the cusp of puberty and suddenly realizing that you have no idea who to trust. Do you trust the adults? They've been your moral compass for years, but they're starting to seem more shady and flawed. Do you trust the teenagers you meet? They're a few years older than you, so I guess they understand more of what you're going through, but they don't seem to know what to do any better than you do. Or do you stick together and only trust each other? There's strength in numbers, even if that strength has no idea what it's doing and is completely terrified all the time. Paper Girls is an ongoing (albeit slow-going) comic written by Brian K. Vaughn (who also writes Saga) with art by Cliff Chiang (who did that really awesome run on Wonder Woman). These guys are basically the dream team, and together they've created a really unique story and world. 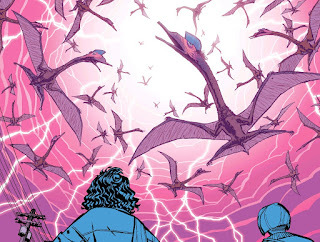 All the events of the comic so far take place in the very early morning of November 1, 1988 when a group of middle-school girls out delivering newspapers run into what may or may not be the apocalypse. The story most closely follows Erin, the new girl in town, who falls in with her fellow paper girls when they save her from being harassed by some local teenage boys. The four girls agree to deliver papers together because it's the day after Halloween, and some partiers are still out on the streets, making it a little unsafe. As they go about their rounds, though, things get pretty seriously weird. First Tiffany, one of the other paper girls, is robbed by people in bad mummy costumes, except the only thing they take is her walkie-talkie. Then the girls sneak into an abandoned house and find what looks like a freaky fleshy spaceship. And then the power goes out and suddenly everyone in the world disappears except for them and the monsters. As the girls go around town trying to piece things together and figure out how to get help, they discover that the mummies - who are actually teenagers with mutated faces - aren't the only ones roaming the streets. There are also futuristic soldiers riding pterodactyls and shooting people with lasers, possibly what has caused everyone they know and love to disappear. The girls seem to be the only ones left because these future forces, whoever they are, didn't think they'd be out so early. Whatever the cause, the four girls have accidentally stumbled into a war between factions of time-traveling armies, taking place on the streets of their hometown, and somewhere in here Erin gets shot. I won't tell you precisely what happens here because I sincerely want you to read these comics for yourself, but suffice to say that the story only gets more interesting from here. There's a mystery surrounding Apple products and apple imagery, a creepy old man with a third eye, and some super rad time travel all working together to make this one of the weirdest and coolest comics you're apt to read this year. But that is, strangely enough, not why I like it so much. 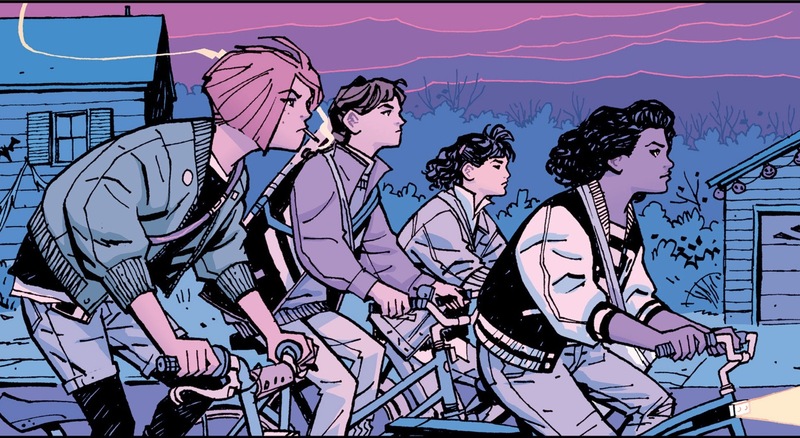 What I love about Paper Girls, as I mentioned up above, is how it works as a metaphor about being just on the cusp of adolescence. I remember being that age and being simultaneously impatient and terrified, waiting for my "real life" to start. It was genuinely scary, facing down a future I had no way to prepare for but had to endure no matter what. 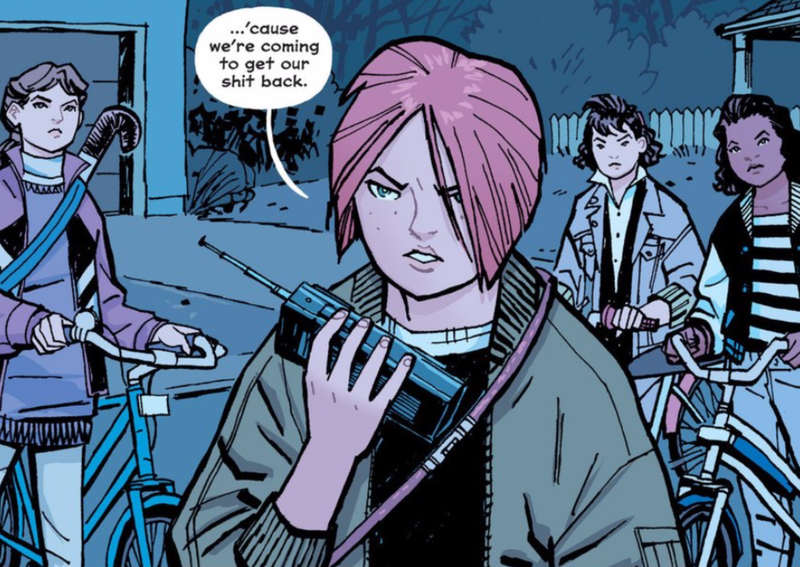 So I relate to the girls of Paper Girls, four twelve and thirteen year olds just about to become teenagers and completely unsure of what they're doing or who they can trust. Since the story of this book is a conflict between generations, a battle between adults and teenagers very literally, it draws the girls and their no-man's-land age placement into sharp relief. They belong to nobody and no one and they have no idea what they're doing, constantly being bounced between the two sides. Making it even more interesting is the fact that these four girls are all really different and have very different views on their future. Erin, our hero, is a space nerd who has nightmares about the Russians killing everyone with a nuclear bomb and who is the most ready to look for answers in aliens and time-travel. She's also a twelve year old girl who seems deeply ambivalent about the way society views her - she's just hit the age where she is viewed "sexually available" and this clearly makes her deeply uncomfortable. She only finds solace with girls her own age who get what she's going through - like the scene where Erin is being sexually harassed by several teenage boys* and is saved by her fellow paper girls. For Erin, at least, the future is a scary place full of unwanted attention and possibly death. The only safe place is with her friends, or possibly with the adults who can protect her from this growing up nonsense. Erin is, after all, the only one of the girls to constantly insist on calling the police. In contrast, Mackenzie, or "Mac" as she's most often called, is thirteen going on sixty. She smokes. She swears. She's already got a bad relationship with the cops. She hates authority and proudly boasts that her father has a gun. She's the one who scares off the teenage boys hassling Erin, and she's the one who tells her to stick by them so she'll be safe. But for all that bluster, Mac is still just a thirteen year old girl with no idea what the hell she's doing. She's scared, deeply and honestly. All this embrace of her future, early embrace of adulthood and adolescence and growing the hell up, masks her fear that the future is one where she's left behind by her friends. There are very clear class indicators in Mac's life that show that she's from a more strictly working class background than her friends, and this backgrounds means that she's worried they will all go off to their private high schools and colleges and forget all about her while she stays there and gets in trouble with the law and slowly rots. Mac is terrified of the future, and who could blame her? Tiffany might come from a family with more money than Mac's, but she's just as scared about the future. With Tiffany, however, it takes a different form. See, as we learn when she has a near-death experience and her life flashes before her eyes, Tiffany isn't afraid of the future exactly. She's afraid that her future will be nothing but more of the same. She's afraid of wasting her future, playing the same stupid videogame, doing the same stupid things all day every day. She's terrified that she's going to wake up one day and never have done anything with her life. This might not seem like the same kind of fear that Erin and Mac have, but it's still a very valid fear about growing up. Doing the same thing every day when you're a kid isn't so bad. It's routine and it's comforting and there's nothing really wrong with it. But staring into the future like that is so much worse. Tiffany's greatest fear about growing up is that she won't actually change, and that seems just as valid as fearing that you will. KJ, finally, has the most complex view of growing up, or at least the most loosely-defined. We know she's just shy of thirteen, as she mentions off-hand that her bat mitzvah is coming up, but she really doesn't say much about the topic otherwise. Instead, she stares at what is happening in the here and now. Out of all the characters, KJ is the one who most lives in the present, focused on keeping her friends safe and getting them all out alive, even if she has to threaten a grown man with an energy gun to do it. In its own way, KJ's refusal to even seem to think about the future is its own kind of fear. We're not clear yet what she is afraid of, but KJ rejects both the teenagers and the adults, clinging to her friend group instead. She's not interested in what either side has to offer, she just wants them all to make it through this. And who could blame her? It's terrifying and hard where they are right now. She's utterly within her rights to reject existential questions and focus on the day to day. But that in and of itself is a realization that the larger questions make her uncomfortable. She doesn't want to deal with it. And I kind of don't blame her. In case you're thinking, "Well, that's nice, but it's clearly all subtext and this is a comic about time-travelers and spaceships, stop thinking so hard," I feel the need to express that I am not just pulling this out of nowhere. 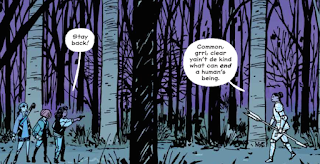 While it's not explicit in the text that this comic is a meditation on what it means to grow up, and particularly what it means to be a just pre-pubescent girl, Vaughn and Chiang have stated that the comic is meant to be a female version of Stand By Me, a famous coming-of-age narrative. So, there's that. I'm not saying that Alice is right in this scene. She's clearly disturbed and extremely drunk. Not that you can blame her: she woke up at five in the morning to see her husband disappear in a pool of light. That would mess anyone up. But it's definitely made clear in the text that to some extent this is a story about growing up. The generational conflict the girls are caught in makes them question whether what they're heading into is actually even worth living for. I mean, teenagers and adults are caught in an endless cycle of aggression and frustration and misunderstanding. What's to like here? I can only assume that as the comic goes on (we're only five issues in, after all), the story will answer some of this. Presumably by the end we'll have answers about growing up and how the girls will eventually deal with their impending adolescence. And that's good. I'm all for resolution. For now, however, I'm actually enjoying living in the confusion and fear of this moment of their lives. That sounds sociopathic, I know, but I think it's actually a really important period of life that is frequently ignored by pop culture. Aside from Tina on Bob's Burgers, it's rare to see a piece of media intentionally engaging with female characters just before they become teenagers. And that's a shame, because it's an incredibly formative period of our lives. I, for one, remember very clearly the first time someone made overt sexual comments to me. I was only eleven, and I remember distinctly how uncomfortable and painfully young I felt in that moment. I was scared. It was scary. I remember realizing that to society as a whole, because I was tall and looked older and developed breasts early, I was "old enough" for this kind of talk. I remember realizing that society now cared what I did with my body and with my behavior in a way it hadn't just a day ago. In that same way, I remember realizing that I was going to be a teenager soon and wondering about the increased freedom and also increased responsibility I would have. I definitely was excited for all of that, eager to grow up, but I was scared too. I was terrified. I think a lot of us were, because it's scary to realize you're about to enter a world and a period of your life you cannot anticipate. It was a rough transition. So it's obvious to me, at least, that this is a time in life that needs more attention. There are good stories here. 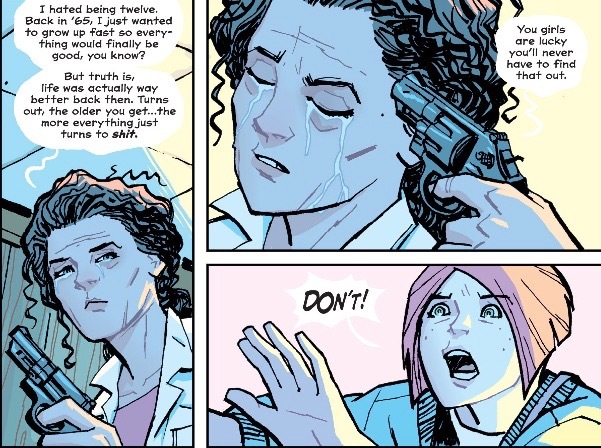 And it feels right to me that the characters of Paper Girls are being left in their fear and frustration and insecurity for a while longer, because that's how it really feels when you're in it. To resolve this too soon would be to cut short the real experience and to deny that it's as earth-shattering as it really was. Being twelve and thirteen can easily feel a little bit like the world has ending. It's narrowed down to you and your friends, the people who can relate to what you're going through. All you see are hostile teenagers and even more hostile adults. There's no one to go to for help because you're not even supposed to be here yet. What can you do? How do you get out of this alive? You grab your sisters and you hold tight, is what Paper Girls says. And I firmly agree. Society has made adolescence a battleground, but we don't have to go quietly. So for all the time-travel and fleshy spaceships and mysterious rays of light in this comic, I'm not here for that. Not really. I'm here for four girls figuring out how to grow up and trying to live through the process. 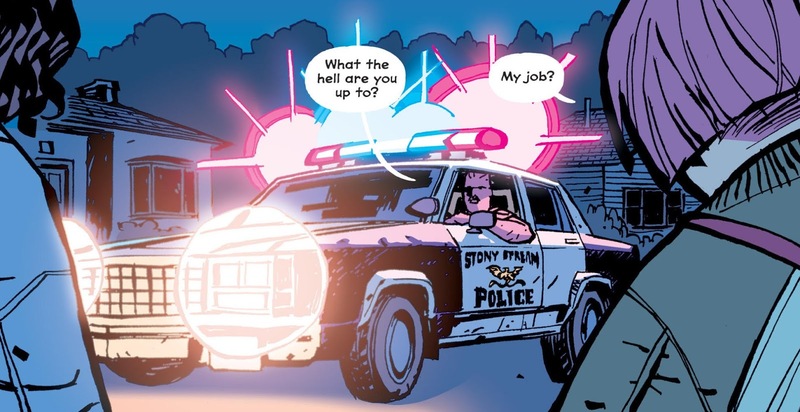 *For the record, this scene might be the most distressing one in the whole comic for me, not for any actual assault that happens, but for the matter-of-fact method of harassment. Upon someone pointing out that Erin is very young and "like eight", therefore not a subject who should be treated sexually, one of her harassers responds with "Grass on the field, man. "** Which is super gross, but also a sign of how our culture routinely sexualizes young girls. **By which he means that Erin appears to have already reached sexual maturity and has pubic hair. Yeah. It's a horrific thing to say to anyone, but genuinely traumatizing to imagine being said to a twelve year old girl.